This article is about the mostly spoken Swiss language, a family of local dialects. For the official language, see Swiss Standard German. Swiss German (Standard German: Schweizerdeutsch, Alemannic German: Schwyzerdütsch, Schwiizertüütsch, Schwizertitsch,[note 1] and others) refers to any of the Alemannic dialects spoken in the German-speaking part of Switzerland and in some Alpine communities in Northern Italy bordering Switzerland. Occasionally, the Alemannic dialects spoken in other countries are grouped together with Swiss German, as well, especially the dialects of Liechtenstein and Austrian Vorarlberg, which are closely associated to Switzerland's. Linguistically, Swiss German forms no unity. The linguistic division of Alemannic is rather into Low, High and Highest Alemannic, varieties of all of which are spoken both inside and outside of Switzerland. The only exception within German-speaking Switzerland is the municipality of Samnaun where an Austro-Bavarian dialect is spoken. The reason "Swiss German" dialects constitute a special group is their almost unrestricted use as a spoken language in practically all situations of daily life, whereas the use of the Alemannic dialects in other countries is restricted or even endangered. The dialects of Swiss German must not be confused with Swiss Standard German, the variety of Standard German used in Switzerland. Most people in Germany do not understand Swiss German. Therefore, when an interview with a Swiss German speaker is shown on German television, subtitles are required. Although Swiss German is the native language, from age 6, Swiss school students additionally learn Swiss Standard German at school and are thus fully capable of understanding, writing and speaking Standard German with varying abilities mainly based on the level of education. Unlike most regional languages in modern Europe, Swiss German is the spoken everyday language of all social levels in industrial cities, as well as in the countryside. Using the dialect conveys neither social nor educational inferiority and is done with pride. There are a few settings where speaking Standard German is demanded or polite, e.g., in education (but not during breaks in school lessons, where the teachers will speak in the dialect with students), in multilingual parliaments (the federal parliaments and a few cantonal and municipal ones), in the main news broadcast or in the presence of non-Alemannic speakers. This situation has been called a "medial diglossia", since the spoken language is mainly the dialect, whereas the written language is mainly (the Swiss variety of) Standard German. Swiss German is intelligible to speakers of other Alemannic dialects, but poses greater difficulty in total comprehension to speakers of Standard German, including French- or Italian-speaking Swiss who learn Standard German at school. Swiss German speakers on TV or in films are thus usually dubbed or subtitled if shown in Germany. Dialect rock is a music genre using the language; many Swiss rock bands, however, alternatively rather sing in English. The Swiss Amish of Adams County, Indiana and their daughter settlements also use Swiss German. 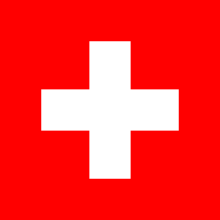 Swiss German is a regional or political umbrella term, not a linguistic unity. For all dialects, there are idioms spoken outside Switzerland that are more closely related to them than some Swiss German dialects. The main linguistic divisions within Swiss German are those of Low, High and Highest Alemannic, and mutual intelligibility across those groups is almost fully seamless, though with some minor exceptions, mainly regarding vocabulary. Low Alemannic is only spoken in the northernmost parts of Switzerland, in Basel and around Lake Constance. High Alemannic is spoken in most of the Swiss Plateau, and is divided in an eastern and a western group. Highest Alemannic is spoken in the Alps. Walser German: Via the medieval migration of the Walser, Highest Alemannic spread to pockets of what are now parts of northern Italy (P), the north west of Ticino (TI), parts of Graubünden (GR), Liechtenstein and Vorarlberg. Each dialect is separable into numerous local subdialects, sometimes down to a resolution of individual villages. Speaking the dialect is an important part of regional, cantonal and national identities. In the more urban areas of the Swiss plateau, regional differences are fading due to increasing mobility, and a growing population of non-Alemannic descent. Despite the varied dialects, the Swiss can still understand one another, but may particularly have trouble understanding Walliser dialects. Most Swiss German dialects, being High German dialects, have completed the High German consonant shift (synonyms: Second Germanic consonant shift, High German sound shift), that is, they have not only changed t to [t͡s] or [s] and p to [p͡f] or [f], but also k to [k͡x] or [x]. There are, however, exceptions, namely the idioms of Chur and Basel. Basel German is a Low Alemannic dialect (mostly spoken in Germany near the Swiss border), and Chur German is basically High Alemannic without initial [x] or [k͡x]. The High German consonant shift happened between the fourth and 9th centuries south of the Benrath line, separating High German from Low German, where high refers to the geographically higher regions of the German-speaking area of those days (combining Upper German and Central German varieties - also referring to their geographical locations). North of the Benrath line up to the North Sea, this consonant shift did not happen. The Walser migration, going on between the 12th and 13th centuries, spread upper Wallis varieties towards the east and south, into Grisons and even further to western Austria and northern Italy. Informally, a distinction is made between the German-speaking people living in the canton of Valais, the Walliser, and the migrated ones, the Walsers (to be found mainly in Graubünden, Vorarlberg in Western Austria, Ticino in South Switzerland, south of the Monte Rosa mountain chain in Italy (e.g. in Issime in the Aosta valley), Tirol in North Italy, and Allgäu in Bavaria). Generally, the Walser communities were situated on higher alpine regions, so were able to stay independent of the reigning forces of those days, who did not or were not able to follow and monitor them all the time necessary at these hostile and hard to survive areas. So, the Walser were pioneers of the liberalisation from serfdom and feudalism. And, Walser villages are easily distinguishable from Grisonian ones, since Walser houses are made of wood instead of stone. Like all Southern German dialects, Swiss German dialects have no voiced obstruents. However, they have an opposition of consonant pairs such as [t] and [d] or [p] and [b]. Traditionally, that distinction is said to be a distinction of fortis and lenis, though it has been claimed to be a distinction of quantity. Swiss German keeps the fortis–lenis opposition at the end of words. There can be minimal pairs such as graad [ɡ̊raːd̥] 'straight' and Graat [ɡ̊raːt] 'arête' or bis [b̥ɪz̥] 'be (imp.)' and Biss [b̥ɪs] 'bite'. This distinguishes Swiss German and Swiss Standard German from German Standard German, which neutralizes the fortis–lenis opposition at the ends of words, a phenomenon usually called final-obstruent devoicing, even though, in the case of German, phonetic voice need not be involved. Swiss German /p, t, k/ are not aspirated. Aspirated [pʰ, tʰ, kʰ] have (in most dialects) secondarily developed by combinations of prefixes with word-initial /h/ or by borrowings from other languages (mainly standard German), e.g., /﻿ˈphaltə﻿/ 'keep' (standard German behalten [bəˈhaltn̩]); /﻿ˈtheː﻿/ 'tea' (standard German Tee [ˈtʰeː]); /﻿ˈkhalt﻿/ 'salary' (standard German Gehalt [ɡəˈhalt]). In the dialects of Basel and Chur, aspirated /k/ is also present in native words. Unlike Standard German, Swiss German /x/ does not have the allophone [ç], but is always [x], or in many dialects even [χ]. The typical Swiss shibboleth features this sound: Chuchichäschtli ('kitchen cupboard'), pronounced [ˈχuχːiˌχæʃtli]. Most Swiss German dialects have gone through the Alemannic n-apocope, which has led to the loss of final -n in words such as Garte 'garden' (standard German Garten) or mache 'to make' (standard German machen). In some Highest Alemannic dialects, the n-apocope has also been effective in consonant clusters, for instance in Hore 'horn' (High Alemannic Horn) or däiche 'to think' (High Alemannic dänke). Only the Highest Alemannic dialects of the Lötschental and of the Haslital have preserved the -n.
The phoneme /r/ is pronounced as an alveolar trill [r] in many dialects, though certain dialects, especially in the Northeast or in the Basel region, have a uvular trill [ʀ] like the one heard in many German varieties of Germany. Most Swiss German dialects have rounded front vowels, unlike other High German dialects. Only in the Low Alemannic dialects of northwest Switzerland (mainly Basel) and in the Walliser dialects have the rounded front vowels been unrounded. In Basel, the rounding is being reintroduced under the influence of other Swiss German dialects. Like Bavarian dialects, Swiss German dialects have preserved the opening diphthongs of Middle High German: /iə̯, uə̯, yə̯/, e.g. in /liə̯b̥/ 'lovely' (standard German lieb, but pronounced /liːp/); /huə̯t/ 'hat' (standard German Hut /huːt/); /xyə̯l/ 'cool' (standard German kühl /kyːl/). Note that some of those diphthongs have been unrounded in several dialects. Like the Low German language, most Swiss German dialects have preserved the old West-Germanic monophthongs /iː, uː, yː/, e.g. /pfiːl/ 'arrow' (standard German Pfeil /pfaɪ̯l/); /b̥uːx/ 'belly' (standard German Bauch /baʊ̯x/); /z̥yːlə/ 'pillar' (standard German Säule /zɔʏ̯lə/). A few Alpine dialects show diphthongization similar to Standard German, especially some dialects of Unterwalden and Schanfigg (Graubünden) and that of Issime (Piedmont). Some Western Swiss German dialects (e.g. Bernese German) have preserved the old diphthongs /ei̯, ou̯/, whereas the other dialects have /ai̯, au̯/ like Standard German or /æi̯, æu̯/. Zurich German and some other dialects distinguish primary diphthongs from secondary ones that arose in hiatus position, i.e. Zurich German /ai̯, au̯/ from Middle High German /ei̯, ou̯/ versus Zurich German /ei̯, ou̯/ from Middle High German /iː, uː/, e.g. Zurich German /bai̯, frau̯/ 'leg, woman' from M.H.G. bein, vrouwe versus Zurich German /frei̯, bou̯/ 'free, building' from M.H.G. frī, būw. Stress is more often on the first syllable than in standard German, even in French loans such as [ˈmɛrsːi] or [ˈmersːi] "thanks". Note that there are many different stress patterns even within dialects. Bernese German is one of the dialects where many words are stressed on the first syllable, e.g. [ˈkaz̥ino] 'casino', whereas standard German has [kʰaˈziːno]. However, no Swiss German dialect is as consistent as the Icelandic language in this respect. There is no preterite indicative (yet there is a preterite subjunctive). The preterite is replaced by perfect constructs (this also happens in spoken Standard German in Southern Germany and Austria). It is still possible to form pluperfect phrases, by applying the perfect construct twice to the same sentence. There is no genitive case, though certain dialects have preserved a possessive genitive (for instance in rural Bernese German). The genitive case is replaced by two constructions: The first of these is often acceptable in Standard German as well: possession + Prp. vo (std. German von) + possessor: es Buech vomene Profässer vs. Standard German ein Buch von einem Professor ("a book of a professor"), s Buech vom Profässer vs. Standard German das Buch des Professors ("the professor's book"). The second is still frowned on where it appears in Standard German (from dialects and spoken language): dative of the possessor + the possessive pronoun referring to the possessor + possession: em Profässer sis Buech ("the professor his book"). The order within verb groups may vary, e.g. wo du bisch cho/wo du cho bisch vs. standard German als du gekommen bist "when you have come/came". All relative clauses are introduced by the relative particle wo (‘where’), never by the relative pronouns der, die, das, welcher, welches as in Standard German, e.g. ds Bispil, wo si schrybt vs. Standard German das Beispiel, das sie schreibt (‘the example that she writes’); ds Bispil, wo si dra dänkt vs. Standard German das Beispiel, woran sie denkt (‘the example that she thinks of’). Whereas the relative particle wo replaces the Standard German relative pronouns in the Nom. (subject) and Acc. (direct object) without further complications, in phrases where wo plays the role of an indirect object, a prepositional object, a possessor or an adverbial adjunct it has to be taken up later in the relative clause by reference of (prp. +) the personal pronoun (if wo refers to a person) or the pronominal adverb (if wo refers to a thing). E.g. de Profässer won i der s Buech von em zeiget ha ("the professor whose book I showed you"), de Bärg wo mer druf obe gsii sind ("the mountain that we were upon"). In combinations with other verbs, the verbs gah or goh "go", cho "come", la or lo "let" and aafa or aafo "begin" reduplicate, prefixed to the main verb. Si chunt üse Chrischtboum cho schmücke. She comes to decorate our Christmas tree. Sie kommt unseren Christbaum schmücken. Si lat ne nid la schlafe. She doesn't let him sleep. Sie lässt ihn nicht schlafen. Si het ne nid la schlafe. She hasn't/didn't let him sleep. Sie hat ihn nicht schlafen lassen. or Sie ließ ihn nicht schlafen. Si wot ne nid la schlafe. She doesn't want to let him sleep. Sie will ihn nicht schlafen lassen. The vocabulary is varied, especially in rural areas: many specialised terms have been retained, e.g., regarding cattle or weather. In the cities, much of the rural vocabulary has been lost. A Swiss German greeting is Grüezi, from Gott grüez-i (Standard German Gott grüsse Euch) or "God bless you". Most word adoptions come from Standard German. Many of these are now so common that they have totally replaced the original Swiss German words, e.g. the words Hügel 'hill' (instead of Egg, Bühl), Lippe 'lip' (instead of Lefzge). Others have replaced the original words only in parts of Switzerland, e.g., Butter 'butter' (originally called Anken in most of Switzerland). Virtually any Swiss Standard German word can be borrowed into Swiss German, always adapted to Swiss German phonology. However, certain Standard German words are never used in Swiss German, for instance Frühstück 'breakfast', niedlich 'cute' or zu hause 'at home'; instead, the native words Zmorge, härzig and dehei are used. Swiss dialects have quite a few words from French and Italian, which are perfectly assimilated. Glace (ice cream) for example is pronounced /ɡlas/ in French but [ˈɡ̊lasːeː] or [ˈɡ̊lasːə] in many Swiss German dialects. The French word for 'thank you', merci, is also used as in merci vilmal, literally "thanks many times". Possibly, these words are not direct adoptions from French but survivors of the once more numerous French loanwords in Standard German, many of which have fallen out of use in Germany. In recent years, Swiss dialects have also taken some English words which already sound very Swiss, e.g., [ˈfuːd̥ə] ('to eat', from "food"), [ɡ̊ei̯mə] ('to play computer games', from "game") or [ˈz̥nœːb̥ə] or [ˈb̥oːrd̥ə] – ('to snowboard', from "snowboard"). These words are probably not direct loanwords from English, but have been adopted through standard German intermediation. While most of those loanwords are of recent origin, some have been in use for decades, e.g. [ˈ(t)ʃutːə] (to play football, from "shoot"). There are also a few English words which are modern adoptions from Swiss German. The dishes müesli, and rösti have become English words, as did loess (fine grain), flysch (sandstone formation), kepi, landamman, kilch, schiffli, and putsch in a political sense. The term bivouac is sometimes explained as originating from Swiss German, while printed etymological dictionaries (e.g. the German Kluge or Knaurs Etymological Dictionary) derive it from Low German instead. Written forms that were mostly based on the local Alemannic varieties, thus similar to Middle High German, were only gradually replaced by the forms of New High German. This replacement took from the 15th to 18th centuries to complete. In the 16th century, the Alemannic forms of writing were considered the original, truly Swiss forms, whereas the New High German forms were perceived as foreign innovations. The innovations were brought about by the printing press and were also associated with Lutheranism. An example of the language shift is the Froschauer Bible: Its first impressions after 1524 were largely written in an Alemannic language, but since 1527, the New High German forms were gradually adopted. The Alemannic forms were longest preserved in the chancelleries, with the chancellery of Bern being the last to adopt New High German in the second half of the 18th century. Today all formal writing, newspapers, books and much informal writing is done in Swiss Standard German, which is usually called Schriftdeutsch (written German). Certain dialectal words are accepted regionalisms in Swiss Standard German and are also sanctioned by the Duden, e.g., Zvieri (afternoon snack). Swiss Standard German is virtually identical to Standard German as used in Germany, with most differences in pronunciation, vocabulary and orthography. For example, Swiss Standard German always uses a double s (ss) instead of the eszett (ß). There are no official rules of Swiss German orthography. The orthographies used in the Swiss German literature can be roughly divided into two systems: Those that try to stay as close to standard German spelling as possible and those that try to represent the sounds as well as possible. The so-called Schwyzertütschi Dialäktschrift was developed by Eugen Dieth, but knowledge of these guidelines is limited mostly to language experts. Furthermore, the spellings originally proposed by Dieth included some special signs not found on a normal keyboard, such as ⟨ʃ⟩ instead of ⟨sch⟩ for [ʃ] or ⟨ǜ⟩ instead of ⟨ü⟩ for [ʏ]. In 1986, a revised version of the Dieth-Schreibung was published, designed to be written "on a normal typewriter". ⟨k⟩ (and ⟨ck⟩) are used for the affricate /kx/. ⟨gg⟩ is used for the unaspirated fortis /k/. ⟨y⟩ (and sometimes ⟨yy⟩) traditionally stands for the /iː/ (in many dialects shortened to /i/, but still with closed quality) that corresponds to Standard German /aɪ̯/, e.g. in Rys ‘rice’ (standard German Reis /raɪ̯s/) vs. Ris ‘giant’ (standard German /riːzə/). This usage goes back to an old ij-ligature. Many writers, however, don't use ⟨y⟩, but ⟨i⟩/⟨ii⟩, especially in the dialects that have lost distinction between these sounds, compare Zürich German Riis /riːz̥/ ‘rice’ or 'giant' to Bernese German Rys /riːz̥/ 'rice' vs. Ris /rɪːz̥/ (‘giant’). Some use even ⟨ie⟩, influenced by Standard German spelling, which leads to confusion with ⟨ie⟩ for /iə̯/. ⟨ä⟩ usually represents [æ], and can also represent [ə] or [ɛ]. ⟨ph⟩ represents [pʰ], ⟨th⟩ represents [tʰ], and ⟨gh⟩ represents [kʰ]. Since [ei] is written as ⟨ei⟩, [ai] is written as ⟨äi⟩, though in eastern Switzerland ⟨ei⟩ is often used for both of these phonemes. ↑ Because of the many different dialects, and since there is no defined orthography for none of them, many different spellings can be found. ↑ Hammarström, Harald; Forkel, Robert; Haspelmath, Martin; Bank, Sebastian, eds. (2016). "Swiss German". Glottolog 2.7. Jena: Max Planck Institute for the Science of Human History. ↑ See, for instance, an Examination of Swiss German in and around Zürich, a paper that presents the differences between Swiss German and High German. ↑ Werner König: dtv-Atlas zur deutschen Sprache. München: Deutscher Taschenbuch Verlag, 1989. ISBN 3-423-03025-9. S. 149. ↑ See Rudolf Hotzenköcherle, Rudolf Trüb (eds.) (1975): Sprachatlas der deutschen Schweiz II 261s. ↑ Archived 8 August 2006 at the Wayback Machine. Albert Bachmann (ed. ), Beiträge zur schweizerdeutschen Grammatik (BSG), 20 vols., Frauenfeld: Huber, 1919–1941. Rudolf Hotzenköcherle (ed. ), Beiträge zur schweizerdeutschen Mundartforschung (BSM), 24 vols., Frauenfeld: Huber, 1949–1982. Peter von Matt, Deutsch in der Deutschen Schweiz. In: Peter von Matt: Das Kalb vor der Gotthardpost. Zur Literatur und Politik in der Schweiz. München: Carl Hanser, 2012, ISBN 978-3-446-23880-0, S. 127–138. Verein für das Schweizerdeutsche Wörterbuch (ed. ), Schweizerisches Idiotikon: Wörterbuch der schweizerdeutschen Sprache. Frauenfeld: Huber, 17 vols. (16 complete), 1881–, ISBN 978-3-7193-0413-3. A Select Bibliography of English Texts on Swiss German offers the homepage of Schweizerisches Idiotikon. Schweizerisches Idiotikon The homepage of the Swiss national dictionary.